Will Adams, a married father of five, retired college professor, and former Corporate Counsel for Fortune 500 companies and smaller firms, has completed his book “Spiral Mirror”: a thoroughly engrossing and time-hopping work of science fiction fantasy. “Spiral Mirror” is a science fiction thriller and passionate love story based on tapes recorded by a college professor, Karl Grayland, while trapped at the foot of Mt. St. Helens in 1980 as it is about to erupt. This event brings him into the jaws of death for the love of two women: Laura Russell, a young attorney who on their journey to Seattle reveals to Karl that she is pregnant with his child; and Ariel, a sprite of a girl whom they rescue along the way only to be lured by her to Mt. St. Helens on that fateful day in May. With the web of time shredded by the convulsing mountain, Karl, led by Arial, is thrust through a magic mirror fifty years into a future in which mankind’s fate comes to rest squarely on him. He learns from his captors how he in a spectral guise can invade the minds of their rivals and control or destroy them at will. Karl soon discovers that his godlike powers come with a compelling need to deploy them. 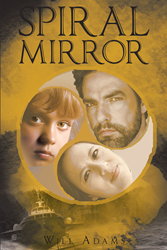 While on the attack, Karl finds a dying Laura and a daughter he never knew, and enlists them to help his captors protect the Spiral Mirror and with it access to all human history. Only after his bloodlust is spent, leaving untold death in its wake, does Karl come to grips with the enormity of his deeds and what it truly means to be human. After learning the true purpose of his ordeal, Karl is returned home by his captors where he and Laura must again face the Mountain’s mighty blow. Published by New York City-based Page Publishing, Will Adams’s book is a spellbinding thrill in which the fate of mankind rests on the soldiers of one man and his willingness to put his humanity aside for the greater good of the human race. Readers who wish to experience this riveting work can purchase “Spiral Mirror” at bookstores everywhere, or online at the Apple iTunes store, Amazon, Google Play, or Barnes and Noble.